It could have been 4-0, or even 5-0, but Roma's 3-0 victory against Chelsea this week in the Champions League evokes a precise memory of more than fifteen years ago. 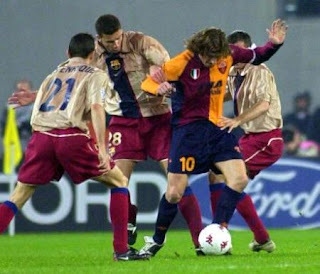 On February 26, 2002, Roma hosted Barcelona in a Champions League group game at the Stadio Olimpico in almost the exact same position as they were at the start of play this past Tuesday--two points behind the leaders, at home, coming off a draw against their opponents in the previous encounter, and not expected to run out emphatic winners. Roma coach Fabio Capello started Francesco Totti, Marco Delvecchio, and Gabriel Batistuta on that day, but it was Emerson who opened the scoring. Well, it's generous to say he did anything intentionally to get the final touch. Totti received a ball from Emerson in the area, and Barcelona defender Philippe Christenval latched on to him so committedly that his captain's armband came off. Totti, while dangling the white armband, passed to Vincent Candela whose shot deflected off Emerson into the goal. Roma went on to score two more goals through Vincenzo Montella and Damiano Tommasi, who replaced Delvecchio and Batistuta respectively. 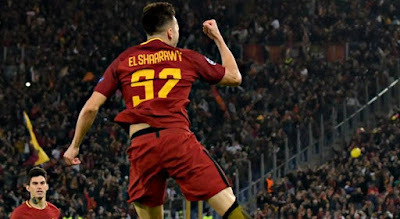 The Giallorsosi won 3-0 in the end in a game that was memorable not only for the scoreline, but also for the exquisite Roma jerseys on display--two even blocks of maroon and yellow, the Scudetto patch, and the Ina Assitalia insurance company sponsor across the front. That game was also pivotal in changing the group's complexion at least for that night, but it only proved in the final calculations Roma's glimpse into what could have been. Their position at the top was short-lived. meaning they only had to avoid losing by more than one goal away to Liverpool at Anfield. They lost 2-0 after goals from Jari Litmanen and Emile Heskey in a game that had a depressing predictability about it before kick-off. You just knew Roma would collapse. Gerard Houllier's Liverpool, along with Barcelona, went through to the quarterfinals. There are similarities this year as well. Roma lead the group now, needing three points to go through. They play Atletico Madrid in a testing encounter in Spain before hosting the gritty Qarabag at home. For Atletico Madrid read Liverpool; for Qarabag read Galatasaray. Roma should look to wrap up their progress in Spain, which won't be easy, but given Atletico Madrid's recent struggles, it isn't impossible. They brushed aside Chelsea with a comprehensively superior performance on Tuesday, but there is history that suggests Roma should be cautious. Italy vs Sweden Thoughts: What is this Italy?